Physical rehabilitation utilizes therapeutic exercise and a variety of other methods to improve function and promote healing. It helps to decrease pain, improve cardiovascular fitness, increase joint mobility, muscle strength and endurance. Companion animals, like their humans, often require physical rehabilitation to recover the ability to walk, regain the use of a limb, and to promote overall well-being after a serious injury or major orthopedic or spinal surgery. A dog enjoying some physical therapy time on the Animal Clinic of Billings underwater treadmill. Those of us who have experienced an injury or surgery know how beneficial physical therapy can be. Rehabilitation exercises lessen pain, strengthen muscles, and speed up the recovery process, helping the body to get back into shape after a traumatic event. Our Wellness and Physical Conditioning Program has been specifically developed for dogs that need more exercise, are overweight, need enhanced strength, or to alleviate chronic pain. This just goes to show that physical therapy isn’t just for humans anymore. 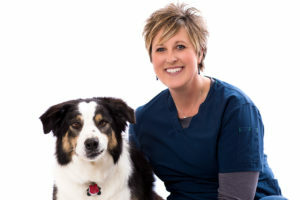 Veterinary rehabilitation is widely regarded as the fastest growing area in veterinary medicine and the number of practices offering rehabilitation services continues to grow. Rehabilitation is increasingly prescribed for our canine companions to address issues such as mobility, pain, and joint damage due to orthopedic surgery, musculoskeletal injury, arthritis, obesity, paralysis, neurological disease, and more. If you’ve seen one of those cute videos of a dog trying to walk on an underwater treadmill or balance on a big exercise ball, you have seen a small part of canine physical therapy at work. What are Physical Rehabilitation TREATMENT METHODS for dogs? Can healthy dogs benefit from physical rehabilitation therapy? Absolutely! Even healthy dogs and cats have canine or feline PRT as part of their regular exercise regime. This is especially popular when the weather makes it difficult to work out – in both the cold of the winter or the heat of the summer. The underwater treadmill is a wonderful cross training tool and is beneficial to any dog’s program. For example, the Animal Clinic of Billings works with performance dogs that come in once or twice a week to exercise in the underwater treadmill for thirty to forty-five-minute sessions. We also have dogs that have undergone rehabilitation visit us once or twice weekly for underwater treadmill sessions. Joey, a 160-pound Leonberger, works out three times a week at the Animal Clinic of Billings. Canine physical therapy helps our furry friends in so many ways including increasing function by enabling the pet to use all of his or her limbs to move around and participate in daily life; decreasing pain due to chronic osteoarthritis or a recent surgery or injury; and, encouraging healing of a wound, a fracture, or a sprain/strain. Physical rehabilitation therapy for dogs continues to evolve to enhance surgical recovery and maintain a comfortable quality of life for veterinary patients in both dogs and cats alike. Call to ask one of our PRT specialist at the Animal Clinic of Billings to learn more about our conditioning for wellness program for dogs. What Is Laser Therapy For Dogs and cats, And How Does It Work? 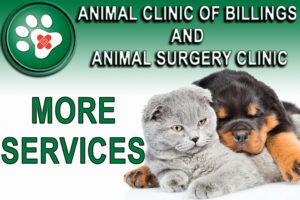 At the Animal Clinic of Billings, we pride ourselves with always searching for new ways to care for your dog especially where pain is concerned. Veterinary laser therapy is an extremely effective treatment option for many ailments that affect pets and humans alike. This treatment option promotes healing through increasing circulation in the affected area, aiding in the cleaning of injured tissues while stimulating cellular metabolism, leading to a decrease in pain. 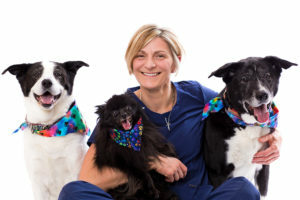 Veterinary laser therapy provides dogs and cats a non-invasive, pain-free, surgery-free and drug-free treatment that is used to treat a variety of conditions, and can be performed in conjunction with existing treatments. This type of therapy will help reduce pain and inflammation, as well as speed the healing process. Although improvement is often seen after the first visit, your dog’s condition will influence how often and long laser therapy is necessary. Treatments vary in length, but most sites require 3 to 8 minutes. Laser treatments for dogs are cumulative, so each additional treatment facilitates a greater improvement in your dog’s condition. The length and frequency of treatments vary by condition, so allow your veterinarian to help devise a sufficient laser treatment schedule for your canine companion. What Types Of Conditions Can Dog and cat Laser Therapy Be Used To Treat? Pain is a common side effect of many of the ailments that we are able to treat through laser therapy. Most often, when a pet begins a laser therapy session, the first sign that the therapy is working is that the animal will suddenly relax, evidencing the fact that their pain is being alleviated. You may notice that your pet sleeps better after a laser therapy session, due to a dramatic decrease in their discomfort. Laser treatments are an excellent way to provide pain relief to your canine or feline companion. Laser therapy reduces pain by reducing inflammation through Òvasodilation” (the opening of blood vessels) and also by activating the lymphatic drainage system, thus draining swollen areas. The result is a reduction in swelling which reduces pain. The lasers also stimulate nerve cells that block pain signals from being transmitted to the brain, thereby decreasing nerve sensitivity. Because there is less inflammation, less swelling and an interruption of pain signals to the brain, the dog or cat will experience less pain. Laser treatments for dogs and cats also stimulate the production of high levels of naturally-produced endorphins which further counteract the animals pain. ATP provides the energy needed for the tissue to heal. This increase in ATP production reduces inflammation, provides pain relief, accelerates tissue repair and cell growth, improves blood flow to site of injury, allows for faster wound healing, and can improve nerve function. Another great feature of laser therapy is that there are no known side effects, and most pets experience positive results immediately. This FDA-approved treatment modality has been clinically proven to be effective in treating a number of health conditions in dogs, cats, and other animals. What Can I Expect At My Dog or cat’s Laser Therapy Appointment? During treatment, pets typically experience a warm, soothing sensation that’s similar to that of a massage. A technician will hold the laser wand directly over the affected area for somewhere between 3 and 10 minutes. However, the amount and frequency of treatments are determined by the specific condition being treated as well as the severity of the condition. There is no pain associated with the treatment and most dogs will relax during this time. The almost immediate relief of pain will allow your dog to be comfortable and any anxiety he or she initially experiences will quickly dissipate. Occasionally, some dogs actually fall asleep during their therapy sessions. Dog laser therapy is a very helpful tool during postoperative recovery. 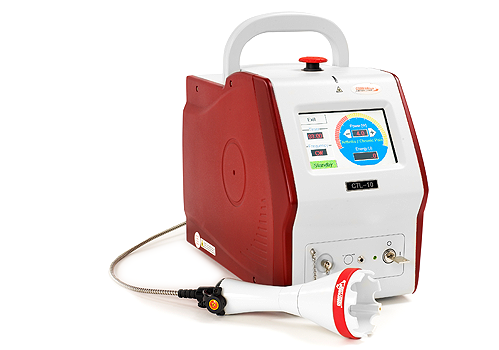 In minor cases, laser therapy alone may be enough to alleviate pain and stimulate the healing process. Because it works directly on injured or affected areas, laser treatments can help speed up healing, strengthen muscle and tissue, improve mobility and enhance your dog’s overall quality of life almost immediately. Is Laser Treatment For Dogs or cats Painful Or Uncomfortable? Are There Any Side Effects Of Laser Therapy For Dogs or cats? We may be able to help reduce the pain your pet is experiencing as a result of these conditions. Have your pet evaluated if you notice limping, an inability to settle, whining, or trembling. Other warning signs include a lack of appetite and difficulty maneuvering through your home, especially up or down stairs. How Can I Schedule A Dog or cat Laser Therapy Appointment? Call and schedule an appointment for your four-legged friend today and receive a 20% discount on a canine rehabilitation therapy treatment for your dog.